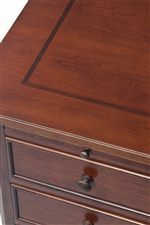 Crafted with handsome Cherry veneer and solid hardwood, this desk brings quality and a timeless look to your home office. This desk, in particular, is packed full of features to make your space clutter-free. Including two locking file drawers, two secretary pull-outs, and a keyboard tray. With this desk, you can finally upgrade the most important piece of furniture in your home office. The Canyon Ridge Transitional 66" Double Pedestal Desk with Walnut Inlay by Winners Only at Crowley Furniture & Mattress in the Kansas City Area: Liberty and Lee's Summit, MO & Overland Park, KS area. Product availability may vary. Contact us for the most current availability on this product. The Canyon Ridge collection is a great option if you are looking for Transitional furniture in the Kansas City Area: Liberty and Lee's Summit, MO & Overland Park, KS area. Browse other items in the Canyon Ridge collection from Crowley Furniture & Mattress in the Kansas City Area: Liberty and Lee's Summit, MO & Overland Park, KS area.